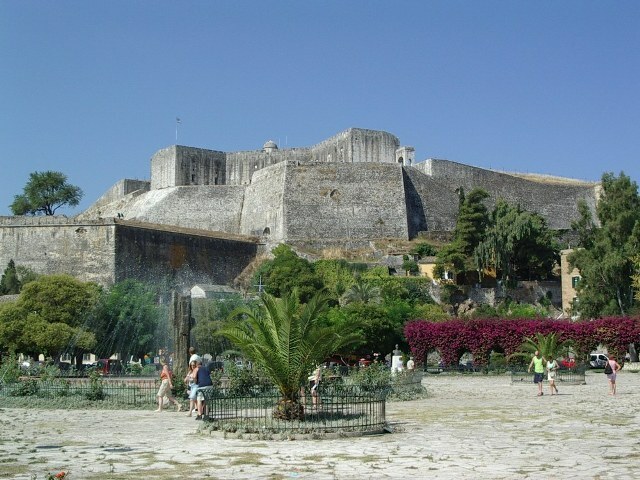 Notes: The New Fortress of Corfu (Greek: Νέο Φρούριο, Venetian: Fortezza Nuova) is a Venetian fortress built on the hill of St. Mark in Corfu in stages. The original architect of the fort was the military engineer Ferrante Vitelli. The current buildings which exist within the fortress were built by the British during their rule of the island (1815–63). At the top of the castle there is a stone building which was used for defence and a brick building which in modern times functions as the headquarters of the Naval Station of Corfu. The Venetian fortifications were later expanded by the British and the French to help defend against a possible Turkish attack. Its fortifications included 700 pieces of artillery with range estimated as far as the Albanian coast.